JULES TAVERNIER | Geringer Art, Ltd.
Jules Tavernier was born in Paris to an English father and French mother in 1844. He grew up mainly in England, and then began his artistic studies in Paris at the age of 16 with artist Félix Barrias. Tavernier first exhibited at the Paris Salon in 1864, and also became connected with the Barbizon school of painting. After serving in the Franco-Prussian War in 1870 Tavernier moved to London where he worked as an illustrator. Later, he moved to New York and created woodcut illustrations for Harper’s Weekly. Accompanied by his friend Paul Frénzeny, Tavernier travelled in the Western United States making illustrations for Harpers. Arriving in San Francisco in 1874, both young artists became members of the Bohemian Club, a spirited group of artists and writers. By 1876 Tavernier established a studio in Monterey, where he executed paintings with strong effects of light influenced by French Impressionism. His works were considered controversial due to their avant-garde technique. Tavernier also worked in the Yosemite Valley during this period, where he made oil studies in a poetic vein. in 1884, deeply in debt, Tavernier and his wife Lizzie sailed for Hawaii. 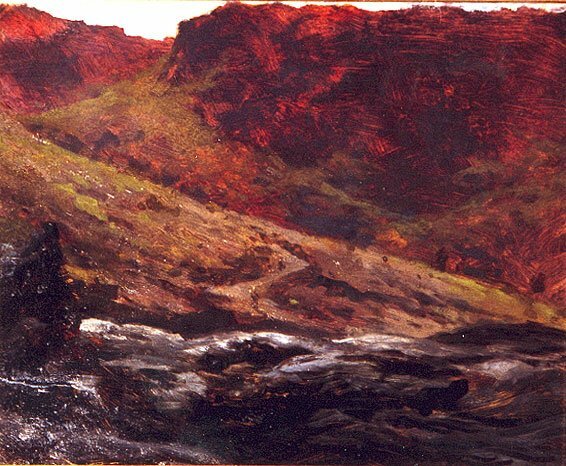 His vivid depictions of volcanic eruptions and lava flows established his reputation there, and his work was suddenly in demand. He spent time on the island of Hawaii, and in the city of Hilo. Tavernier’s grandiose ideas, drinking, and overspending created enormous personal problems, and after his wife returned to San Francisco, the family of artist D. Howard Hitchcock family took him in to try and help him quit drinking. Tavernier in turn, became an artistic mentor to Hitchcock. Tavernier died in his Honolulu studio in May of 1889, and is buried in the Oahu Cemetary, Nuuanu Valley under a marker provided by his friends from the Bohemian Club. He is remembered as a gifted painter, especially of volcanoes, capable of dazzling visual fireworks.